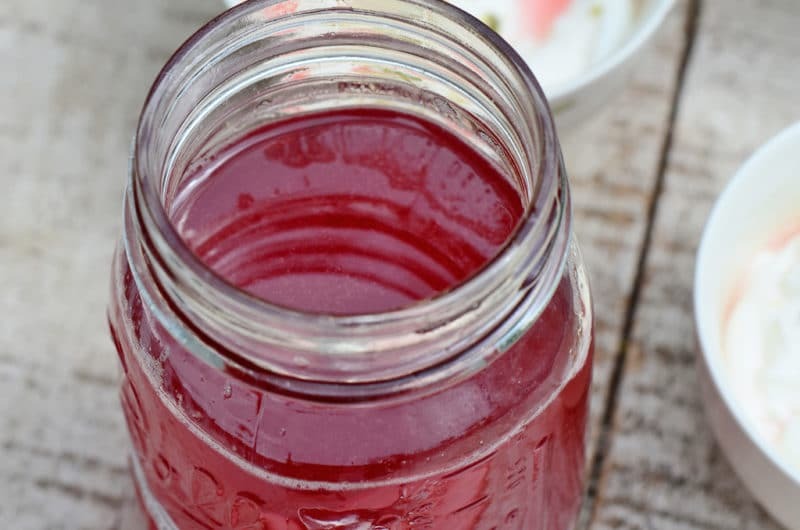 I can’t get over how delicious rhubarb rosewater syrup is. The recipe comes from the elegant Heidi Swanson of 101 Cookbooks, whose photography, books and recipes are wonderful. 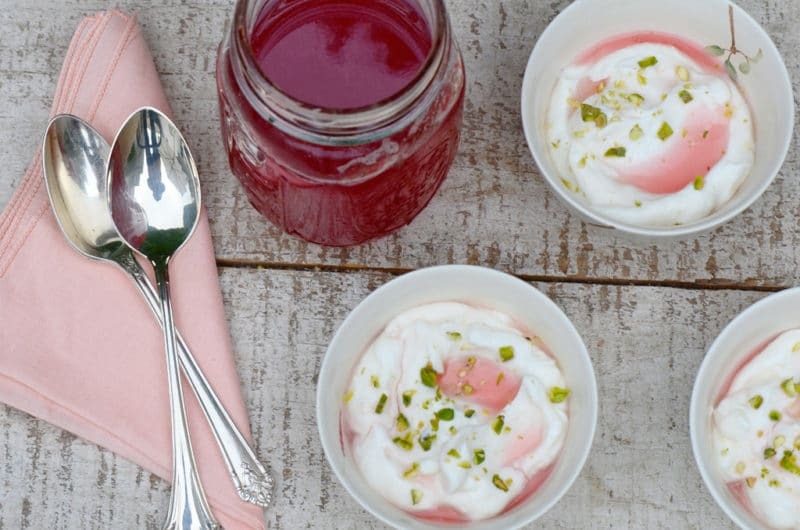 You will want to reserve the rhubarb to eat once the syrup is poured off. Use the syrup to make beautiful, flavorful summer cocktails. Or to top vanilla ice cream for a sundae. 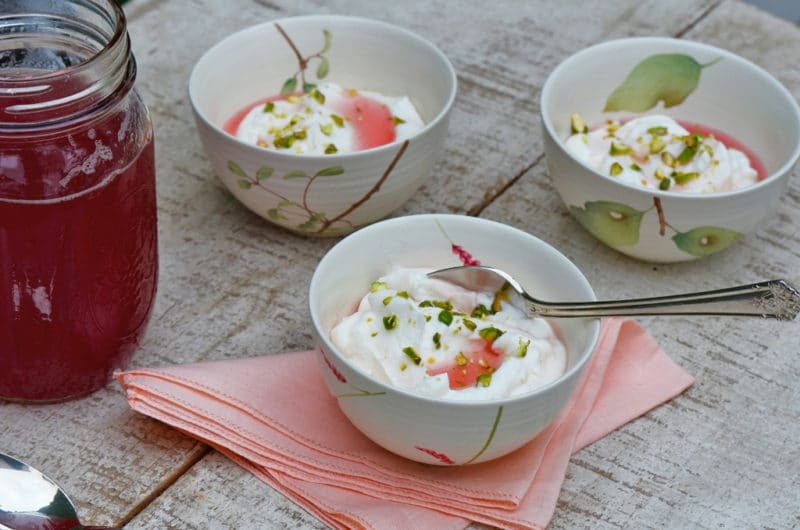 It’s a treat over labne with pistachios on top for breakfast or an afternoon snack. Go easy on the rosewater; mine took only a few drops to enhance the syrup. If you’re not a rosewater fan, just leave it out altogether, and this is still a winner. It all started when I arrived in Florida for a visit in March. My nephew ran out to the car but kept hiding from me, so I thrust my camera bag in his hand to keep him close. Carry this in for me! I said. Yay! he shouted, and ran off. Amid all of the arrival excitement I didn’t think much of the way he was swinging the bag like a five year old would, making a game out of it. When I found my camera completely gone dark the next day, I couldn’t imagine what would have caused the problem. I coddle my camera and lenses with great pride, congratulating myself every time I take it slow, tuck everything in just so, keep lens covers on all exposed glass, and so on. It is not my tendency to take it slow with these kinds of things, even though I will get madly focused on taking it slow with projects like decorating cookies. But when I bought the camera I had just gone through a month without my laptop because, well, I dropped it. I had taken the computer to bed with me when I was out in San Francisco last spring, and when I went to put it on the floor in the middle of the night with one hand, there was a very loud tumble. The next day I faced the blue screen of hell, made that much more agonizing by the fact that I hadn’t backed up in about three months. So the camera was going to get all my lovin’. And it did, right along with my recovered laptop and my new way of doing things, like using scissors to cut tags off. Or eating less quickly. Or unpacking right away after a trip. The salesmen at Ritz camera in Florida were not terribly encouraging about the camera. Oh wow, that’s a doozie, one said. Surely is, said another looking on with total consternation while chewing what had to be at least two sticks of Juicyfruit. Standing there in their red shirts, I had the feeling they had no idea what they were talking about. That was confirmed when I picked up the phone and called my local (if you can call 90 miles from home “local,” which you can in northern Michigan) camera shop in Traverse City. Send it up, or bring it on in, they said. And not to be rude, but Ritz camera is like the Target of camera stores, they said. It’s not a real camera shop. I headed to Traverse City when I got home and wouldn’t you know, the guy fixed my camera right there on the spot. No sending back to Nikon, no warranty window to beat. This, this is why I keep it local! I thought to myself. Personal attention and know-how. I got so excited that I bought another lens, a wide angle, and a few other camera treats to boot. Then on the ride home through Grand Traverse County, the cherry blossoms begged for a photo. Just as I got out of the car with my camera hanging from my neck, the car door got in the way (it appeared out of nowhere) and I slammed into the camera, sandwiching it between me and the car door. A nice chip of black paint came off the car, Dan’s car, and I felt like someone had sucker punched me, but otherwise all seemed fine. Until I was in Lebanon and pulled out that lens. It refused to focus, and worked just enough to drive me and anyone else I asked (like our driver Hisam, who I can’t wait to tell you more about) to take a photo with it completely crazy. Back to Traverse City. A beautiful ride, and this time, no good news about the lens. It would cost so much to fix it that I might as well buy new and improved. So be it. I reconciled myself to it and loosened up enough to stop at Friske Orchards on the way back, where the first stalks of rhubarb were waiting to be procured, to be photographed and cooked. They would be our first taste of the new season up north. I tucked them into the car right beside my camera pack, which had everything all buckled up. Or so I thought. Because when I pulled it out in my excitement to get in the kitchen and make what promised to be an insanely delicious, remarkably pretty and photogenic rhubarb-rosewater syrup recipe, the camera bag opened up and out spilled the camera with the brand new lens attached. It smacked the cement driveway but good. And I smacked myself, quite literally, as I looked at the sky and said you’ve got to be kidding me. Mrs. Smith across the street, if she was watching from her kitchen window, must have thought I’d really lost it. Good thing I was alone, because I sat on the driveway and cried a little. 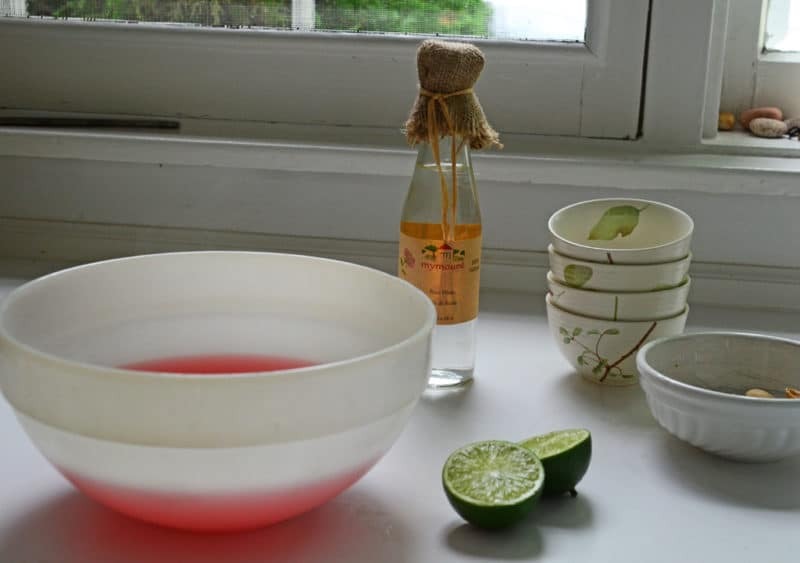 Then I picked everything up and went inside and made rhubarb-rosewater syrup. As I suspected, it really is insanely delicious. This is a recipe that will be with me a long, very long time, and I hope for you too. I drizzled it over some labne. And sprinkled pistachios over top. Later I mixed the syrup up with some soda water and vodka to take the edge off, savoring it nice and slow, just the way all good things ought to be taken care of. 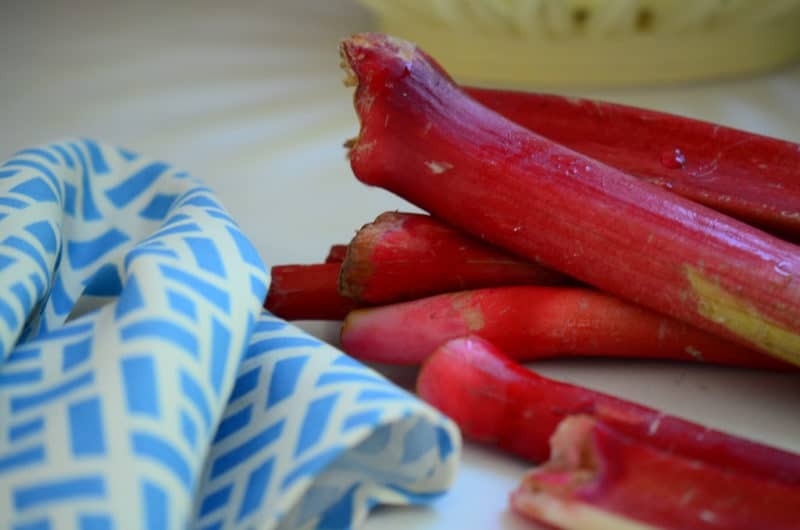 In a small heavy saucepan, mix the rhubarb with the sugar. Let it sit like this, off the heat, and macerate for about 45 minutes, stirring occasionally. Add the water and bring to a boil over medium heat, stirring occasionally until the sugar dissolves. Simmer for 20 minutes, until the rhubarb begins to break down. Carefully strain into a bowl through a cheesecloth-lined strainer. Transfer to a clean saucepan, stir in the lime juice, and bring to a simmer. Let simmer over medium heat for another 15 minutes or until the syrup reduces and is slightly thickened. 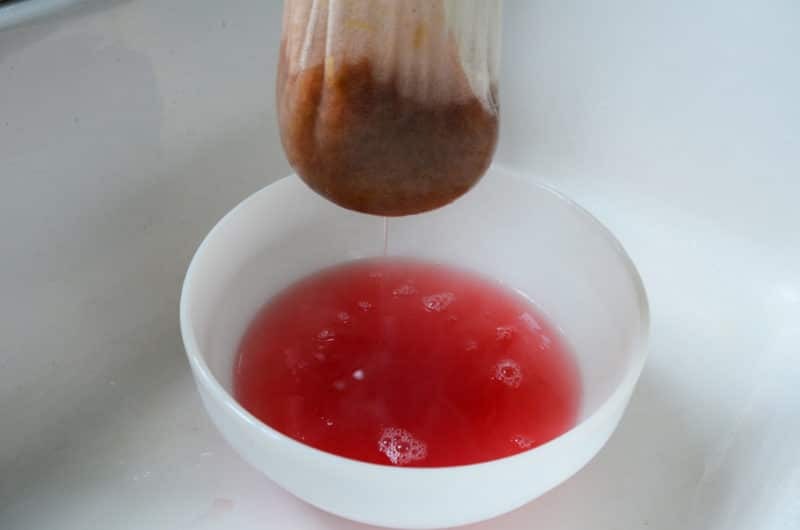 Remove from heat and stir in the rosewater a drop at a time, tasting to see if you've got enough. Allow the syrup to cool completely before transferring to a glass jar. Keep the syrup refrigerated and use over yogurt or ice cream, and in lemonade, soda water or cocktails. The recipe makes one medium jar of syrup, which will last about a week. 4 Responses to "Rhubarb Rosewater Syrup"
Ohhh, how I miss my moms rhubarb. Because I am not a fan of Rosewater, I use Orange Blossom Water. BTW, your camera story is hilarious….what are we going to do with you? Slow down girl, it can get expensive. LOL. Again, thanks for sharing your amazing whit and perseverance. If substituting Orange Blossom Water for Rose water, what amount would one use? Hi Selene–You can use a touch more orange blossom water than rose water, so for this start with 1/4 teaspoon, taste, and add a little more if you like.